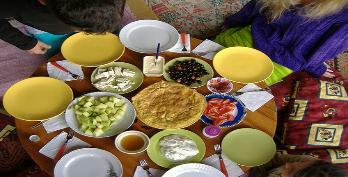 People need a break from the stresses of everyday life and this is what we offer at Gokpinar. At our retreat in the mountains we offer a life that is far from the stresses of daily life. wild bird life and the smells of a great breakfast. We eat vegetables organically grown in our own garden, we bake and eat our own bread. people need peace in their life as much as they need to see different places. What we provide is something off the beaten touristic path. A simple sufi life with peace. from us and a world away from our daily lives. secluded bays of the Aegean coast, and stay far away from traffic . ourselves. There are no sessions but there is the life itself. You will definitely not feel alone. 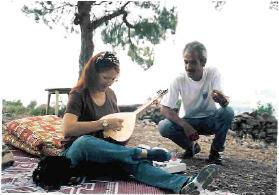 Come experience the unique style, the music, the taste, the laughter of life in Turkey. You are invited to Gokpinar where sufism comes to your heart from ! For bookings you can send some deposit (you can choose the amount) via paypal or credit card mail order payments. transfers in Istanbul at budget costs.Please ask for details. Our comfortable, airy guest rooms have great views of the countryside. 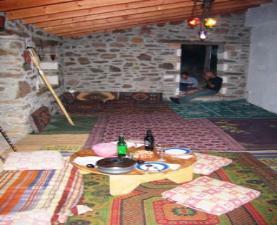 We decorated in Turkish style, with kilims created locally covering our floors and walls. 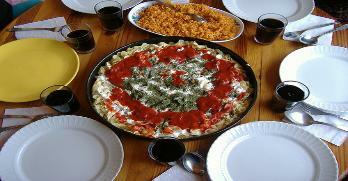 a place with the special, warm welcome of Turkish hospitality! 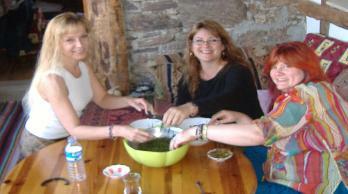 Gokpinar Retreat Center is located on the Aegean Coast of TURKEY. drive from some of the best beaches of the area . will give you another taste of our culture. chance to pick fresh tomatoes, cucumbers, onions, corn, beans, squash, melons, & other fruit. We have several kinds of fruit trees, and water melon is a refreshing treat for us all summer! delight your senses, body and soul. delightful, unforgettable experience waiting for you.